Burton Albion’s Lucas Akins believes they have a chance of knocking holders Manchester City out of the Carabao Cup. 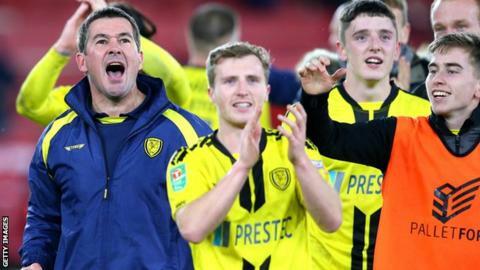 The League One side drew the Premier League champions in the semi-finals after beating Middlesbrough on Tuesday. Akins says they will draw inspiration from Wigan Athletic, who knocked City out of last season’s FA Cup. “We’ve got to look to them and take as much as we can from that and why not dare to dream and think we can win?” he told BBC Radio Derby. The Brewers will travel to the Etihad in the first leg on 7 January, with City making the return trip two weeks later. “To go there away first is going to be a great experience, but we’re looking forward to getting them back to the Pirelli Stadium and I can assure the fans it’ll be an exciting tie,” said striker Akins, who has played more than 200 games for Burton since joining from Stevenage in 2014. The League Cup has seen several upsets in recent years. Bradford City, from League Two, reached the final in 2013 after beating Premier League sides Wigan, Aston Villa and Arsenal – as well as Burton – on the way, but lost to Swansea at Wembley. Last season Championship side Bristol City made the semi-finals by knocking out Manchester United and fellow top-flight sides Crystal Palace, Stoke City and Watford before going down 5-3 on aggregate to Manchester City. “Our task is not going to be an easy one at all,” added Akins. “I can imagine the bookies backing against us, but that’s what cup football is all about and people will be rooting for us no doubt. “Anything’s possible, it’s a cup competition. We’ve had some very difficult opposition in the previous rounds and we managed to pass those tests, so it’s going to be another one.